A social network represents a set of social entities that interact through relationships like friendship, co-working, or information exchange. Social Network Analysis studies the patterns of relationships among social entities and can be used to understand and improve group processes. The arrival of new communication tools and networking platforms, especially the Web 2.0 Social Networking Services, opened new opportunities to explore the power of social networks inside and outside organizations. 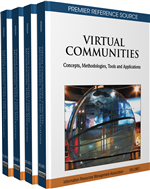 This chapter surveys the basic concepts of social networks methods, approaches, tools, and services. In particular, this chapter analyzes state-of-the-art social networks, explaining how useful Social Network Analysis can be in different contexts and how social networks can be represented, extracted, and analyzed in information systems.